This PDF 1.5 document has been generated by Microsoft® Word 2016, and has been sent on pdf-archive.com on 28/06/2017 at 00:27, from IP address 104.218.x.x. The current document download page has been viewed 76 times. File size: 595 KB (2 pages). 50M Americans will be older than 65.
interventions; this lowers health care costs to the supporting healthcare network. 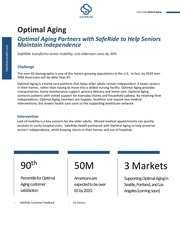 seniors’ independence, while keeping clients in their homes and out of hospitals. and memory loss. Charlie relies on his daughter, Susan, for rides to medical appointments. Unfortunately, Susan struggles because Charlie’s appointments conflict with her work schedule. ratings exceed the 90th percentile. enrollment. “SafeRide has been a wonderful solution to my father’s mobility issue, “ says Susan. a new industry: home health,” he says. the broader Midwest, the Carolinas and the greater New York area. This file has been shared by a user of PDF Archive. Document ID: 00617558.